Sharni realized she had hit rock bottom. Her husband’s Bipolar disorder disease had taken control of both of their lives and her body began to shut down in response to the havoc it was inflicting on her Soul. 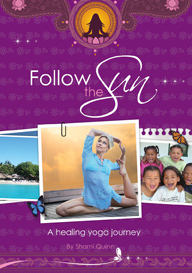 Follow the Sun is Sharni’s personal memoir of descending into darkness, facing her fears, and then mustering up the courage to heal and find her inner light again through yoga travel, and gratitude. 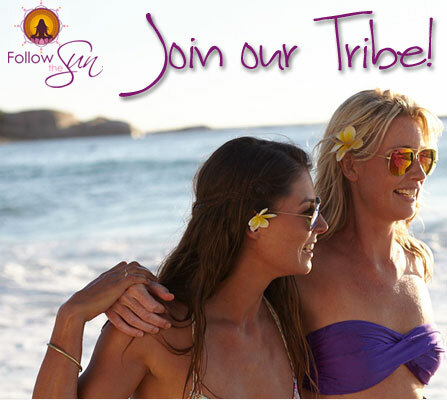 In 2010 Sharni decided to travel and dedicate nine months to the pursuit of rediscovering her inner light. Chasing the sunshine and teaching yoga for charity along the way, Sharni soaked up knowledge from Indian Yoga teachers during sunrise on the beaches of Goa and experienced Mumbai – Bollywood Style – while living with an Indian family. She enjoyed eco-cycle tours through rice paddies while singing Yogic mantras in Bali, and finally, learned how to dive on the Great Barrier Reef and taught yoga and ‘Follow the Sun’ Workshops in Australia. This personal healing journal will inspire any woman who has had to rebuild herself after losing everything and it will show you how yoga and following your intuition can transform a broken life into a powerful adventure based on trust, personal wholeness and inner guidance. “When you feel bliss, happiness and compassion and you feel the light inside you, you open yourself up to the incredible possibilities and profound experiences that await you. The most rewarding part about it though, is when you pass the light on. This is my way of passing on the light.